The Sigray Twin-Lens is a revolutionary x-ray optic designed to be efficiently coupled with the newest generation of ultrabright micro and nanofocus x-ray sources. The inner surface profile of the optic is shaped with a matched pair of paraboloids: one that collimates a diverging beam and a second optic that focuses the collimated beam onto a single achromatic focal spot. The Sigray Twin-Lens is a completely new approach in laboratory x-ray optics, enabled by highly sophisticated, proprietary manufacturing techniques that minimize slope errors and surface roughness (on the order of angstroms). The lens provides tremendous performance advantages compared to x-ray optics that have conventionally been employed in laboratory x-ray systems, such as: polycapillary x-ray optics, conventional monocapillary x-ray optics, and Montel-type optics. Below, comparative analyses between the twin paraboloidal x-ray lens and polycapillary optics and between the Twin-Lens and ellipsoidal monocapillary optics are provided. Additional information may be requested comparing the optics to monocapillary and Montel type optics. Polycapillaries are "wave guides" in which x-rays are directed from one area to another by multiple reflections. In contrast, Sigray's TwinLens are imaging optics in which surfaces are carefully shaped to perform point-to-point imaging. As an imaging optic with constant magnification for points both on-axis and off-axis, the double paraboloidal x-ray mirror lens provides a single, sharp focal spot for all x-ray energies. In comparison, polycapillaries are not imaging optics. Instead, they are effectively “wave guides” in which x-rays are internally reflected multiple times within each tapered capillary before emerging at the other end in a larger, less focused spot. Because different energies of x-rays all have different critical angles of reflection, each x-ray energy will produce a different size focal spot (inversely proportional to the x-ray energy) on the sample. As a result, a polycapillary optic used downstream of a polychromatic x-ray source will produce multiple concentric spot sizes that depend on energy, as shown in the figure below. Because it is a true imaging optic that performs point-to-point imaging instead of a waveguide that relies on multiple bounces to guide x-rays from one area to another, the spot size of Sigray's Twin-Lens x-ray optic is a single spot that is energy-independent. Sigray offers working distances between 10 to 50 mm for its small focus spot, which can be tailored and selected by the customer due to the achromatic imaging nature of the optic. In contrast, the minimum spot size achieved by a polycapillary is heavily dependent on the working distance and x-ray energy. For example, often the minimum spot sizes quoted for polycapillary-based systems can only be reached at single digit (e.g. 1-5 mm) working distances for higher energy x-rays. Working distances are even smaller (e.g. <<1 mm) for lower energy x-rays! Such small working distances are impractical for samples with even minor topography, as seen below, as the spot size changes dramatically when scanned across the sample surface. As described above, Sigray’s mirror lens produces a single, small achromatic focal spot while polycapillary optics result in larger spot sizes of varying sizes. Having a single spot size for all x-rays enables accurate quantification in microanalysis, whereas multiple spots will produce interfering signals that are not from the region of interest. Moreover, the “pencil beam” delivered by Sigray’s lens (due to its large working distance) maintains a stable spot size over a sample’s surface, which even if polished, still has some level of topography. The single, small, stable spot size provides superior quantification. Sigray's optic produces a pencil beam and a single spot size, both of which are ideal for accurate quantification. Moreover, the Sigray mirror lens does not suffer the well-known “halo artifact” problem of polycapillary optics that further reduces analytical performance. High throughput for microanalytical applications is achieved through the coupling of a high brightness source and optic capable of preserving the high brightness of the x-ray source. Sigray’s mirror lens is designed to be used with ultrabright, small spot sized sources that polycapillary optics are unable to couple efficiently with, such as liquid metal jet sources, nanofocus transmission sources, and Sigray's patent-pending microfocus source. Moreover, the interior of the mirror lens can be coated with a high atomic number element (e.g. platinum) to provide an even larger critical angle acceptance of the x-rays, which increases the numerical aperture and collection efficiency of the optic to further increase flux at the sample. The advantage of the Sigray mirror lens coupled to a high brightness x-ray source can be seen when comparing the AttoMap™ microXRF versus a conventional microXRF system. The AttoMap™ achieves over 500X the throughput in comparison and is uniquely capable of mapping trace elements at reasonable acquisition times. The high efficiency of Sigray's optics, combined with the high brightness of the FAAST source, enable synchrotron-like acquisition speeds to uniquely enable the system to map trace-level elements at high throughput. In comparison, most conventional microXRF systems are only capable of trace analysis through spot analysis, because the acquisition times are simply too long for reasonable-throughput mapping. Traditionally, x-rays have been considered appropriate for fluorescence analysis of higher atomic number elements, while electrons are considered more appropriate for lower atomic number elements. Several factors have led to this misconception, chief among them that conventional x-ray optics perform very poorly for low energy x-rays (spot size increases dramatically and working distance becomes impractically small). 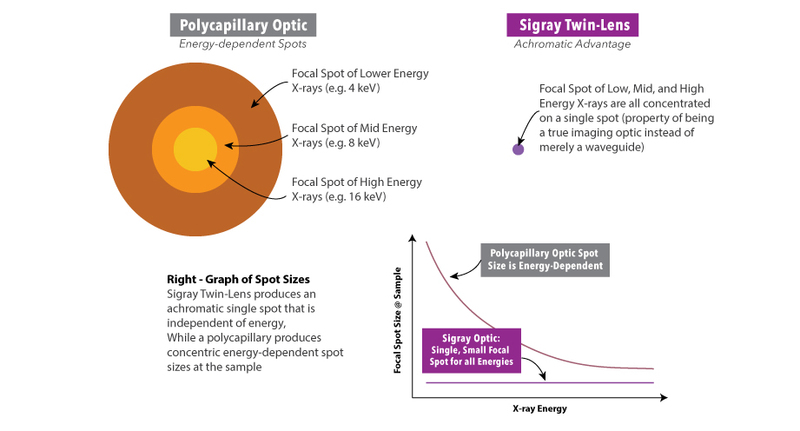 Sigray's double paraboloidal optics uniquely provides high resolution and high efficiencies - even for low energy x-rays to enable higher sensitivity for SAXS, XRD, and microXRF of low atomic number elements. The Twin Paraboloidal X-ray optic offers tremendous flux advantages over standard x-ray collimators and tapered monocapillaries. A more interesting comparison is how the optic performs in comparison to ellipsoidal x-ray concentrators. A summary of the major differences can be found on the following page. Reflective Surface: Coated with Pt. Other coatings available upon request. Working distance: 10-100 mm. Depends on desired application and can be modified. Some customization of the optics may be available. Inquire with the form below. Interested in how the Double Paraboloidal X-ray Mirror Lens will help your particular application?